Butler was a kitten when he wandered up to someone’s house, looking for help. He was living all alone outside, trying to fend for himself. It was really scary for him, because he was still a little guy and all the strange noises at night frightened him. And he stayed hungry. When he stumbled across the house, he was so happy. The kind lady started feeding and caring for him, but she was unable to bring him inside. Butler was OK with that; as long as he was fed and had somewhere to sleep at night. But then one day the lady saw that he was badly hurt. She took him to the vet and it was determined that his leg was broken. The lady could not afford the surgery, so she said she had to euthanize him. 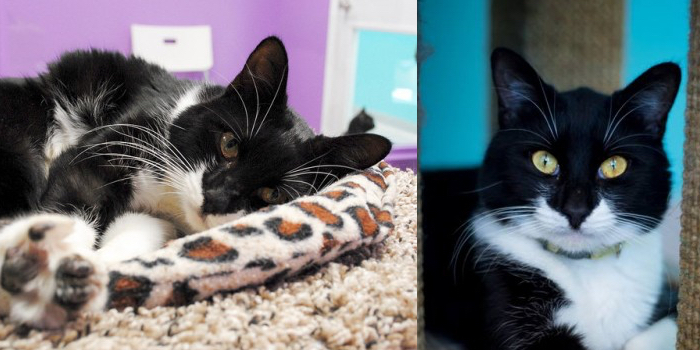 Because Butler was so young, the vet did not want to end his life, so Good Mews was contacted. We said we would be happy to help Butler. He had surgery on his leg, a few weeks of cage rest, and his leg healed great! He was soon able to run and jump like he did before he was injured. Once he was released to the main shelter, it was obvious he was a very shy boy. He would sometimes run if you approached him or tried to pet him. He started to trust a little more and was then adopted. Sadly, it didn't work out in his home because he would always run from his adopters and they were afraid they would not have the ability to take him to a vet if need be. So one of our staff members went to pick Butler up. He remained shy and timid for several months, then all of a sudden he decided he was tired of being shy and wanted people to pet him! Now if you approach him while he is sitting on a cat tree, you can stroke his back and he loves it! Butler is also a very playful guy that loves running around the shelter, batting toys around or carrying them around in his mouth. He is pretty high energy, so he would love a home where he has another playful cat to hang out with. Butler has had such a hard time finding the right family for him and we are hoping now that he is overcoming his shyness, he will find the perfect family soon. He may regress a bit once he first goes home, but with a patient adopter, he should relax in no time!